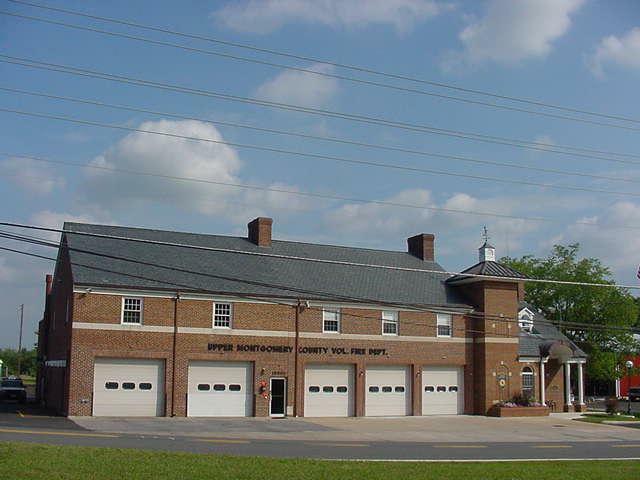 The UMCVFD was created, built, and supported by the members of the community in the western part of Montgomery County. Community involvement is the critical component responsible for the success of this organization. Whether through direct involvement as a firefighter/rescuer, Auxiliary member, Corporate member, or providing crucial support at fundraisers or other department events, the community plays an important role in the Fire Department. The stimulus to organize a volunteer fire department came from the Monocacy Lions Club. In 1945 a committee was formed to explore the feasibility of starting a new fire department. The first meeting of the new fire department was held January 7, 1946. On April 26, 1946 a charter was signed creating the Upper Montgomery County Volunteer Fire Department, Inc. The 5 signers of the charter were from each of the 5 major communities of Barnesville, Beallsville, Dawsonville, Dickerson, and Poolesville. Prior to this time, fire and rescue services were provided from Rockville, Gaithersburg, or the city of Frederick. In January 1947 a bond issue was authorized by the State of Maryland in the amount of $35,000.00 along with the legislation approving a property tax of up to 10 cents per $100.00 of assessed property value within the department's first due area. In addition to this the First National Bank (now AllFirst) in Poolesville approved a loan of $30,000.00. A site was selected that would be as centrally located to the five towns as possible. Several parcels near the intersection of Route 28 and Route 109 were combined to create the lot on which the firehouse would be built. The lots were donated by the Howard Griffith family, the T. Lloyd Grubb family, and the Carlton Van Emon family. Construction began in the summer of 1947 for a contract price of $35,000.00. A ceremony was held July 26, 1947 at which time the cornerstone was set and a time capsule was placed behind the cornerstone. The first election was held on April 8, 1947 with the following officers being elected: President Charles Davis, VP Lloyd Jones Jr., Secretary Erskine Hamilton, and Treasurer Carlton Van Emon. Bill Griffith was appointed Acting Chief due to his experience with the Silver Spring Volunteer Fire Department. Bill served as Acting Chief until April 1948. The first piece of fire apparatus was purchased in September 1947 at a cost of $8,300.00. It was a new Mack pumper with a 500 g.p.m. pump and 475 gallon water tank. This was housed at the Spring Valley farm, just east of Beallsville, until the firehouse was completed in 1948. A chain driven Cosmopolitan fire engine was donated by the Chevy Chase Fire Department in 1948. This remained in service until 1953 when a Diamond T pumper replaced it. In the beginning there was no central alarm facility. Fires were reported to the fire department members individually. Often a column of smoke was seen and the general location of the fire was all that was known. Three sirens were placed into service in Beallsville, Dickerson, and Poolesville to assist in alerting the members of an emergency. In 1950 the county government covered the entire county with a centralized dispatching service. The first ambulance was placed into service in 1953. A used 1948 Buick was purchased with $2,500.00 donated by the Monocacy Lions Club. Bill Griffith was appointed Captain of the Rescue Squad. Les Thompson taught the first First Aid class. The Ladies Auxiliary was formed in July 1946 with Emma Kohlhoss elected as the first president. The original membership numbered 87. The Auxiliary helped raise funds by holding card parties, white elephant sales, dinners, bingo, bazaars, and serving lunch at farm sales. The first fundraiser was a picnic held in Barnesville in September 1946 realizing a profit of $1,101.36. In March of 1955, a Marching Unit (Junior Auxiliary) was organized with 35 members. The first President was Vivian Weller. The Marching Unit represented the Fire Department at area parades, as well as assisting with fundraising activities. In 1980 the two groups formed a single Ladies Auxiliary and in 1982 became The Auxiliary. The first two paid firefighters were hired in October of 1966 to supplement the volunteers during the day. This staff was increased to 3 in 1967. The paid personnel at UMCVFD were hired and managed by the Board of Directors until January 1988 when the Montgomery County Department of Fire and Rescue Services took over all of the career personnel throughout the county. The UMCVFD continues to provide services by a combined force of volunteers and a career staff of 6.